SAN DIEGO—Many patients are finding physicians won’t take their insurance, but emergency departments are required to do so under the ACA, causing these patients to “slam” hospital EDs, Cuningham Group’s Phil Soule tells GlobeSt.com. SAN DIEGO—Many patients are finding physicians won’t take their health insurance, but emergency departments are required to do so under the Affordable Care Act, causing these patients to “slam” hospital emergency departments, Cuningham Group Architecture Inc. designer and principal Phil Soule tells GlobeSt.com. The firm, along with its partner, Swinerton Builders, was recently recognized with a National Design-Build Project/Team Award during the Design-Build Institute of America’s 21st-annual Design-Build Project/Team Awards for the Sharp Mesa Vista Hospital expansion and modernization project. Sharp Mesa Vista Hospital is San Diego County’s largest privately operated psychiatric hospital and one of the largest behavioral-health providers in the nation. Originally constructed in the 1960s, the facility provides comprehensive behavioral-health services for patients experiencing anxiety, bi-polar disorder, depression, dementia, substance abuse, eating disorders and other conditions. The redesign expanded the facility to 26,800 square feet. Having only undergone minor upgrades since the 1970s, the hospital needed renovations that were wide in scope, ranging from improving major mechanical components such as HVAC to vastly improving patient care and staff conditions. In planning its redesign, Cuningham Group involved hospital administration, caregivers, patients and families. Three buildings were transformed over six construction phases, with the hospital continuing to provide care. The new facility incorporates the latest in “Planetree” principles of patient-centric healthcare design, according to Cuningham Group associate principal. 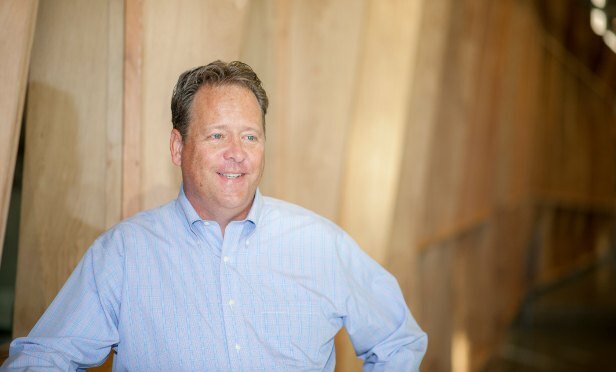 We spoke with Soule about the latest trends in hospital design and what makes Sharp Mesa Vista’s expansion and remodel stand out. 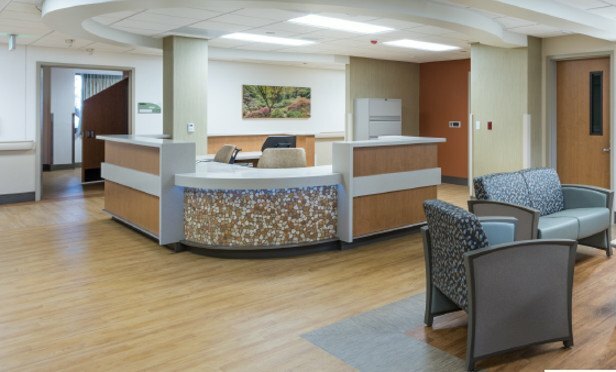 GlobeSt.com: What are you noticing as the latest trends in hospital design? Soule: It’s much more focused on outpatient and emergency departments. Primarily, what the hospitals are seeing is that the physicians won’t take Obamacare or ACA insurance, and EDs are required to, so much of the people who are on that brand of insurance are slamming EDs. It’s interesting because the goal of the whole thing was to move patients out of the acute-care setting. That’s a huge trend. Also, part of hospitals’ reimbursement is based on patient-satisfaction scores, so they’re really focused on the patient experience. That’s really good for us on the remodeling front. The new nurse station at Sharp Mesa Vista Hospital features an open plan that allows staff to engage with patients and family members rather than hide behind glass walls. GlobeSt.com: What are hospitals needing the most from renovations today? Soule: Some healthcare decisions like orthopedic and having a baby are marketing-based decisions. People will check out facilities and choose where they want to go, so these facilities are having to keep up with each other in terms of quality of space as well as quality of staff in those service lines particularly. Healthcare delivery decisions are most commonly made by a mom, so if mom has a great experience having a baby in one facility, the family tends to stay with that hospital. They spend a lot of money on labor and delivery and tours for that reason. GlobeSt.com: What makes the Sharp Mesa expansion and remodel stand out, in your opinion? Soule: The parts we were working in hadn’t been renovated in a very long time. There were some licensed beds they took away and made into offices, so we converted those rooms back into beds needed for mental-health services. We’re designing with Swinerton Builders another project at Sharp Mesa Vista on a different floor. Soule: California-based trends are slightly different because of SB1953, a bill related to seismic compliance. You have to classify every building from a one to a five. Ones can’t be used now, but twos become non-compliant in 2030, and most every hospital in town has a building that’s a two that they’ll have to upgrade or replace by 2030. If they don’t, they can’t have any patients or any required things—kitchen, surgery, surgery support. We see more new construction in California than a lot of other places because of that.